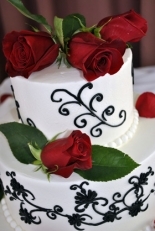 May 28, 2015 (Lemon Grove) – If you’re looking for a wedding cake that’s personalized, beautiful and delicious, you’ll find your heart’s desire at Grove Pastry Shop in Lemon Grove. When San Diego Style Wedding magazine held a competition for wedding cake bakers last year, Grove Pastry Shop won six of eight categories (and didn’t enter the other two). 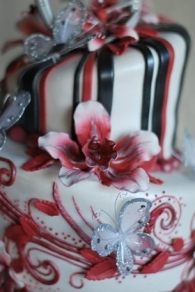 In business since 1947, the bakery has evolved with the times, now offering an array of options ranging from specialty cake flavorings from mango to margaritas, as well as decorating options from tiered chandeliers to tattoos. One thing that hasn’t changed, however, is the bakery’s commitment to quality –with all cakes hand-crafted and baked the old-fashioned way, with the finest ingredients using many personal recipes from owner Teresa Johnson.